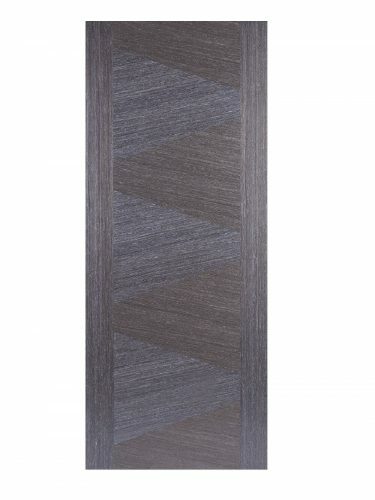 Ash Grey Zeus FD30 Fire Door a very striking contemporary effect. Ash Grey Zeus FD30 Fire Door version. 30 minutes Fire Safety Certified. Crisp clean lines, in a very modern Style. Pre-finished – ready to hang. Also available as a standard (35mm) door and has a classy glazed variant too! The FD30 Fire Door version of the Ash Grey Zeus. So, this Fire Door achieves a fire safety rating of 30 minutes for areas requiring a greater level of protection. A solid internal door with crisp clean lines, in a striking Ash Grey Veneer design. Also this is suitable for all areas of the home, including dining room, living room, bedrooms and bathrooms. The Ash Grey Zeus has seven lateral triangular panels. Further the grain in each panel is set in an opposing direction to create a very distinctive contemporary effect. A Pre-finished, engineered door which is ready to hang. It has an engineered, hardwood, solid core (weight 50kg) with two layers of 10 mm lippings all round. It comes with a manufacturer’s 10-year warranty. Moreover, the Ash Grey Zeus is also available as a standard (35mm) door and has a spectacular glazed variant too!